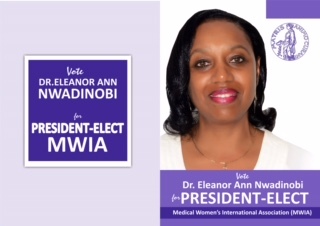 Upload Date: May 13, 2016 Full Size Image Dimensions: 320 × 226 Image Parent Post: #Nigeria’s 1st candidate for @MedWIA Pres-elect @NSRProgramme’s Dr. @ELEANORANNNWADI! @hillaryclinton is @womenintheworld! Was at @womenintheworld when Secretary Clinton announced and again after the election. She's raising and addressing the tough issues and always closes out #witw leaving us thinking and energized! After #Kwibuka25 looking forward to hearing @hillaryclinton at #witw @womenintheworld! Need to "flex" on my wonderful human rights students who made me exceedingly proud at their first of two briefings at @unitednations this month. Just a great group of concerned, caring, respectful, diligent, prepared and brilliant students! Next up, another briefing tomorrow with my second class of excellent students!! Anyone needs interns, let me know! I give my students the highest recommendation!! What a special day! Got to visit with my beautiful and brilliant cousin #laniguinier, Prof. Emerita @harvardlaw, had a mini-#paulweissrifkindwhartongarrison reunion (missed you @crystalmccrary!) with #nanabediatuoasante, had the opportunity to see the phenomenal @badassboz again (who I first saw with my dear friend @lucybelize at the @aaiafrica gala), reconnected with another dear friend @ablessedsongstress and finally had the honor to hear The President of the Republic of Ghana, Nana Akufo-Addo @nakufoaddo's keynote address @harvardkennedyschool and wish him a very Happy Birthday, again, at a dinner in his honor @harvardartmuseums! !